Regent Ballroom is located in Savoy, IL. We have a spacious ballroom to host your big event. Our catering services and full bar are sure to keep your guests full and happy! 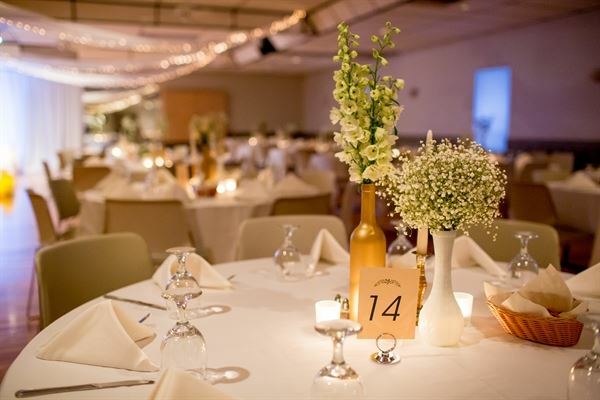 At the Regent Ballroom you get the complete package -- full service catering and bar, solid oak flooring, uplighting, ceiling light display, and event coordinator on-site. And our convenient location offers ample parking, exclusively for your guests. Whether it's a wedding, retirement party or any special occasion, the Regent Ballroom is a great venue to host your event. Make unforgettable memories with us! Regent'a Dinner Buffet Two Entree Buffet | $23.50 per person Additional Entrees | + $2.50 Includes 2 Salads & 2 Side Choices - Served with Fresh Baked Rolls and Honey & Herb Butter - Coffee & Iced Tea Station & Table-side Water Service • Herbed Chicken Breast • Chicken Cacciatore • Mediterranean Chicken • Mushroom Chicken • Linguini Shrimp Scampi • Tuscan Rigatoni • Meat Filled Tortellini • Penne a la Carbonara • Glazed Pork Tenderloing • Thyme Roasted Pork Loin • Teriyaki Flank Steak • Caramelized Onion Flank Steak • Cranberry-Mushroom Brisket • Barbeque Beef Brisket • Ricotta & Parmesan Stuffed Ravioli • Vegetarian Lasagna • Penne Primavera • Pesto Cream Cavatappi Please see attachment for additional information and menu options. Our spacious ballroom boasts 5,000 square feet of beautiful hardwood floor, just waiting for your guests!